We got back from our holiday yesterday, and today I lacked the inspiration to do a full supermarket shop, so instead went to my favourite local asian green-grocer and stocked up on a huge load of fresh fruit & veg with a couple of little extras thrown in. I grabbed a bag of frozen prawns (cooked, tails on) while I was there as well, and thus ensues tonight's delicious dinner! 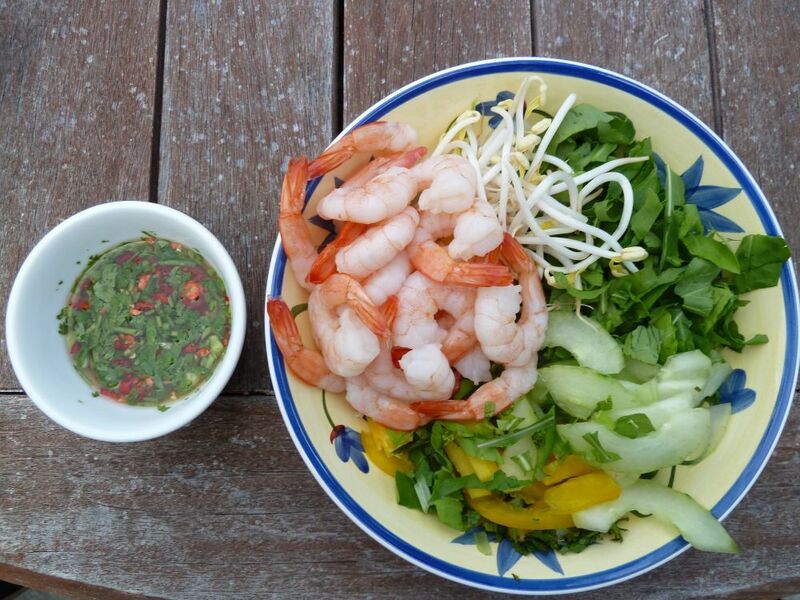 We love vietnamese style food - it is so fresh, crisp, clean and bursting with flavour. First, make the sauce. Very finely chop the whole chilli (seeds & all), roughly chop the coriander then mix all ingredients - adding the fish sauce a bit at a time and tasting to check the balance of flavours. Set aside to allow the garlic & chilli to infuse while you prepare the rest of the salad. Finely chop the rocket (I know, rocket is a little odd for vietnamese, but if you like it and have it, use it, otherwise substitute). Finely slice the spring onion & capsicum. Peel & deseed the cucumber, slice thinly on the diagonal. Place the vermicilli in a bowl and cover with boiling water (from the kettle). Leave for 5-7 minutes. Rinse in cold water, drain well then divide between 2 bowls. I had no peanuts, so at this point I added a dash of peanut oil to the vermicilli. Ordinarily, I'd finish the dish with a sprinkling of chopped peanuts. Top the vermicilli with the prepared salad ingredients, plus the mung beans & prawns, leaving the diner to mix their own salad. Finally, divide the sauce into 2 bowls, serve. To eat - toss the salad and sauce, enjoy! Located at the Hilton in Taupo, Bistro Lago is regarded as one of the top restaurants in Taupo. I had heard good reviews about the restaurant so was looking forward to our meal this evening. We arrived at sunset, and whilst it was lovely to look out over the lake, the sun in peoples eyes was not ideal. The restaurant has a nice atmosphere although some of our party of four found the chairs extremely uncomfortable. We started with some lovely ciabatta for the table, that came with a nice olive oil, balsamic vinegar and a truffle mascarpone that I thoroughly enjoyed, although Jane wasn’t too sure about. I started with the Steak tartare which was excellent and I would happily order again. Others at the table had the scallops and thoroughly enjoyed them and Jane had the Alaskan King crab & prawn in jalapeno crème fraiche sauce topped w tuna wafers that she enjoyed (those moving wafers always freak me out a bit though!). For my main course I had the duck which was nice although the sauce was a little too sweet, Jane had the lamb and found this to be nice and others had the eye fillet of beef, which was nicely cooked and flavoursome and the Alaskan King crab entree. All of the dishes were nicely presented, but the main courses in particular took an excessive time to arrive. So much so, that we got multiple apologies and this was followed up by a free round of coffees and also a round of dessert wine. For dessert my first choice of the crepes was not available, so I had the frozen grapefruit souffle, which I found to be too sweet so did not finish it. Jane had the Mango Samosa, which she enjoyed and the remainder of the table had the excellent Chocolate Fondant. So it was a mixed evening of enjoyment and we will probably try elsewhere for our next nice meal out in Taupo. Located on The Strand in Tauranga, we ended up at the Horny Bull restaurant last night after finding that our intended destination, the fish & chip shop, was closed. We were informed as we arrived that there would be a wait for meals since they were busy; we were fine with this and got a nice location outside and settled in with a beer and a spiced tomato juice respectively (although the spiced tomato juice wasn’t very spicy). We started with some Buffalo Wings to share, and whilst they did taste nice they could have done with been spicier. Jane had the Pork Ribs for her main; these were done in a sweet plum sauce and were flavoursome. I had the T Bone Steak, and did not make a good choice of sauce (Red Wine and Pepper), but the steak was nicely cooked and enjoyable once I scraped the sauce off. I found the accompanying curly fries tasted too fatty and could have done with being crispier and the salad dressing appeared to have thyme in it, which I feel dragged it down. The restaurant had a nice outdoor vibe and the staff were friendly. Whilst we would return, it wouldn’t be our first choice. Located in a beautiful setting, Mills Reef have a superb selection of wines and an excellent cellar door experience (Morgan, in particular, was very knowledgeable and friendly). After sampling some (okay, a lot) of wines, we proceeded through to the restaurant and a nice table outside sheltered from the sun by one of their numerous outdoor umbrellas. We started with some lovely fresh breads which were accompanied with butter, olive oil and a salmon and sour cream spread. The olive oil was nice, but the salmon spread was a bit too salty. I then had the Chinese poached duck with plum, kumara mash and wilted bok choy and Jane had the Vietnamese prawn salad with peanuts, iceberg lettuce, mint and coriander. The duck dish was nice, although the duck was a little dry. Jane found the prawn salad was disappointing; underdressed and the mint and coriander could be described only as sparing. The service started off great and our waiter was eagerly refilling our water as soon as it got below half and our meals arrived promptly. As the restaurant got more populated, the service declined and we observed a number of other tables trying to get attention. We decided we would like to order coffees but after 15 minutes of inattention just asked for the bill instead. 15 minutes later the bill still hadn’t arrived, so we went up to the counter and paid there instead. For an experience that started so well, it’s a shame that we ended up leaving disappointed. We had a lovely meal out at the Bombay Brasserie in Tauranga last night. This is a very clean restaurant located in Wharf Street, just off the Strand. Complementary Papadoms were provided to start as we looked over the menu with INXS music playing in the background (Hmmm, not exactly authentic music). We did however notice that Indian music was playing by the time we got our meals. We chose two dishes to share for our meal and they arrived in a timely manner; a Goat Pasanda (diced goat lightly sautéed in onions, garlic, ginger, coriander, tomatoes, with spices, yoghurt, cream and crushed almonds) and a Chicken Tikka Masala. We requested both dishes to be a medium spice level, and found them to both be more on the hotter end of medium (which was fine for us, but may be a bit spicy for others). The meals had a nice raw heat and were very flavoursome. The owner (or at least we think it was the owner) seemed very interested in how we found the meal; his waitering style could however do with a bit more polish. The meals were on the pricier side for what I expect to pay for Indian dishes ($19.90 each) but the quality of the meals would see us returning. We had a good meal out at Lone Star in Tauranga this evening. The wait staff were friendly and knowledgeable about the menu, and even though they got my order wrong they put in right and paid for a round of drinks. We started with a cobb loaf with garlic butter. Both the cob loaf and the garlic butter were nice and soft and it was a good start to the meal. No sooner had we said to each other that the mains were taking a while that they arrived. Well, one of them was correct (as per above), and the other one arrived about 5 minutes later. Jane had the Honky Tonk Chicken which she found was really tasty and a Medium size was definitely enough. I had Rock the Boat, which consisted of Snapper seasoned with fresh herbs and parmesan and served with a lemon and caper cream sauce that was equally good. We were sitting outside overlooking the harbour and the restaurant had a good vibe. We would happily return.